Netflix’s suspense thriller The Perfection just released a new official trailer along with a creepy poster. 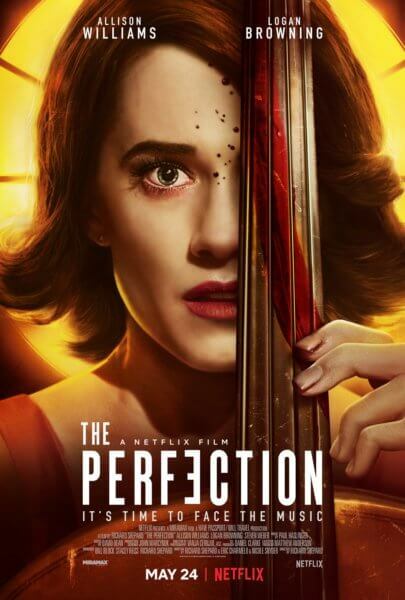 The Perfection made its debut at the 2018 Fantastic Fest and will be released on Netflix beginning May 24, 2019. Allison Williams (Get Out), Logan Browning (Dear White People), Steven Weber (Channel Zero), and Alaina Huffman (Supernatural) star in the dark comedy/horror film. Eric Charmelo and Nicole Snyder co-wrote the film with director Richard Shepard. Shepard, Bill Block, and Stacey Reiss served as producers. The behind the scenes team includes director of photography Vanja Cernjul, editor David Dean, and costume designer Beverley Huynh, with music by Paul Haslinger. The horror film from writer-director Richard Shepard (Dom Hemingway, Girls, The Hunting Party) is currently sitting at 75% fresh on Rotten Tomatoes. Deirdre Crimmins from Rue Morgue says the movie’s “playfulness and body horror anchor an uncommon film into some incredibly entertaining waters.” I Love Splatter’s Amie Simon also gave the film a positive review and went one step further, predicting it’s destined to become a cult classic.